The upsides of getting older are relatively few and far between, but one of the best is that you get to annoy younger people by dragging up things from the past that they have no memory of. And so it’s been this week: I’ve been musing on the late 1980s and the oddities of monetary policy, while several of my colleagues have sat there, giving me the smile you give old people when they start off again. Since you’ve got this far, I’ll assume you’re either: a) at least as old as I am, or: b) one of those particularly bright young people, genuinely wishing to learn from the past. Your pick. So back in the 1980s and early 1990s, much of British European policy was about money, and specifically Sterling’s relationship with the Exchange Rate Mechanism (ERM). In essence, the government sought to find an accommodation with that system that tried to satisfy several policy objectives at once. Most importantly, it was trying to stabilise Sterling’s position in forex markets: the eighties had been rather a rollercoaster, with big impacts on public finances (and thus public policy). Secondly, the hardening of ERM – fewer and fewer changes in central target rates between member currencies – was making the block an ever more important reference point for the British economy, not least in the broader context of the 1992 single market programme. And finally, there was a big bunch of party politics going on, as Thatcher moved into her later years in office. The failure of multilateral instruments in the early and mid 1980s seemed to close down that route, so the Treasury – which then ran the Bank of England and exchange rate policy – cast around for other options: if you’d like a good summary of all this, then Philip Stephens’ Politics and the Pound should be your first port of call. For a year, from early 1987, the option that was followed was shadowing of the Deutschmark, but in secret. 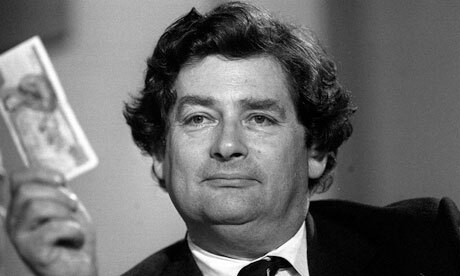 The then Chancellor, Nigel Lawson (father of Nigella, younger readers), instructed the Bank to keep the exchange rate just under 3.00DM, but never formulated it as formal policy, nor discussed it with anyone else. Of course, the rapid mounting up of foreign reserves and the large amount of public speculation eventually brought this to a close, when Thatcher shut the door on it, just in time to cut the legs from under Lawson’s 1988 budget. This seemed to harden his resolve to move towards ERM membership and so to his sacking by Thatcher. However, Thatcher’s determination not to join was ultimately undermined by her Cabinet’s insistence, including of the men brought in to replace her old guard. Eventually, Sterling did join in 1990, in the dying days of Thatcher’s premiership, but at a rate that was to prove unsustainable. In September 1992, that pressure led to Sterling’s ejection – Black Wednesday – which both trashed the Conservative’s reputation as economic managers for a generation, while also lying the conditions for a period of strong economic growth. The reason this all comes back to mind is that some parallels with the Brexit process seem to be in order. Most obviously, the episode points to the importance of credibility in commitments. The UK is about to move into a period where it is managing a divergent relationship with the EU, potentially with much of that resting on unilateral commitments to respect EU regulation. The Withdrawal Bill will be the mainstay of this, but there will necessarily be a need for more general political commitment to playing by externally-set rules. The ERM saga highlights the difficulties of doing such a thing when others either don’t know you’re doing that or don’t believe you’re doing it. Money markets were able to make sizeable profits off playing government policy: Black Wednesday famously saw fortunes made, as speculators refused to believe that the BoE would reservedly back Sterling, and that other central banks would do the same. That the Bundesbank seemed indifferent to the fate of Sterling merely underlined matters – all the more so a year later, then it fought hard to keep the French Franc in. Clearly, credibility is in equally short supply now: European partners remain unclear about the UK’s intent post-withdrawal, even as the UK faces much pressure to carve out exceptions and changes to the acquis in the medium-term. Even if the UK commits now to retaining that acquis, that seems to be a less-than secure guarantee of equal standards and procedures, which in turn raises questions of market access. But the period also raises issues of British particularity. It was evident that economic cycles weren’t synchronised – and that no one was prepared to try to synchronise them – and that shocks tended to be asymmetric: Bernard Connelly’s Rotten Heart of Europe is a great bit of economic analysis (sprinkled with a pile of rage). The fundamentals weren’t really in place to help the policy work, whatever the politics. The question is whether that has now changed. We’re 30 years on from shadowing and market integration has proceeded afoot, but it’s worth reflecting on whether economics might lead politics once more. The strengthening of the Eurozone and the weakening of the British economy will create a number of incentives to act that might not align with the political imperatives. And finally, this blast from the past poses the big question of who’s in control. The ERM ‘stab in the back’ was a big part in the myth-making around Thatcher – she was right to fight off membership, and we shouldn’t trust those who seek European policy solutions – but in the end, the main message seemed to be that markets set exchange rates, not politicians, whatever their politics. Of course, we worry less about exchange rates than we used to. But the point still holds: the economic effects of Brexit will be sizeable, to the point that either the British government nor the EU can mitigate or avoid them fully, even if they wanted to. This doesn’t mean that policy-makers shouldn’t try, but rather that they should be frank about the limits to their power and about the range of potential outcomes. One hallmark of the late 1980s-early 1990s was that all these policy issues were debated and decided within a very small circle of politicians. Their failings contributed to the weakening of trust that now makes our current situation all the more challenging. If I were being dull I’d close by wheeling out the old Santayana quote about the past, but while hunting for the reference I noted another quote from his Life in Reason: “Fanaticism consists in redoubling your efforts when you have forgotten your aim.” Something else to think about, as you get older.